William Doreski's most recent collection of poetry is Another Ice Age (2007). 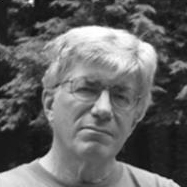 He has published three critical studies, including Robert Lowell's Shifting Colors. His essays, poetry, and reviews have appeared in many journals, including Massachusetts Review, Notre Dame Review, The Alembic, New England Quarterly, Harvard Review, Modern Philology, Antioch Review, Natural Bridge. and drags a beard across the sky. has roasted their brains in their skulls. when fate takes a capital F.
and we scream with fear in the dark. standing as upright as I should. grins like a fossil jawbone. Far off, the coughing of shotguns. and blasting the tame birds to rags. for the sake of corporate fortunes. lichen clinging to its peeling bark. I heft it, swing it in the air. Despite its bulk it weighs nothing. my offering to the day.